Russia’s Evgeny Kuznetsov broke China’s dominance of the FINA/NVC World Diving Series in London taking gold in a high scoring, high quality men’s 3m Springboard final. It was the first gold medal of the London event to go to a diver outside China. Kuznetsov, silver medallist in the 3m Synchro Springboard at the London 2012 Olympic Games, produced a superb final dive, a forward 4 1/2 somersault tucked, to score 98.80 points for a final total of 519.40 points. It was enough to move him from third place after five rounds to first after six. Kuznetsov’s secured his win by the slimmest of margins finishing just 0.05 of a point ahead of Germany’s Patrick Hausding who ended the night with 519.35 points. ‘I knew what I needed to do,’ Kuznetsov said about his final dive. ‘I thought it was a good dive but I didn’t know for sure,’ he added. Going last and doing exactly the same final dive as Kuznetsov, Olympic 10m Synchro Platform champion, Cao Yuan of China, needed 94.25 points to win. He managed 91.20 and had to settle for bronze with 516.35 points. Earlier the hot favourite, Jack Laugher of Great Britain, sensationally failed to qualify for the final. Laugher, winner of the 3m Springboard at the two previous rounds of the World Diving Series, in Kazan and Dubai, was knocked out of the competition at the semi-final stage. Diving last, in the second semi-final, Laugher came out short on his penultimate dive, the difficult forward 4 1/2 somersaults in the tuck position, scoring just 45.60 points. It was the second lowest score of the semi-final leaving Laugher needing a massive 89.10 points from his final dive to secure qualification. He came tantalisingly close with 88.20 points but it wasn’t enough to overtake Lin Yue of China who claimed the third, and final, slot by just 0.90 of a point. ‘I’m gutted,’ Laugher said afterwards. ‘The fifth dive is normally my highest scoring dive. I took off and thought it was going pretty well,’ he said. ‘Something was off this morning’. Laugher, who won silver in the men’s 3m Synchro Springboard with partner Christopher Mears the previous evening, refused to blame the late night finish for his performance. ‘I should have been on form,’ he said. ‘There are no excuses’. In the women’s 3m Springboard final Shi Tingmao, 23, made it two golds in two days, adding the individual 3m Springboard title to the 3m Synchro Springboard won, with Wu Minxia, on day one. Shi, who has won every round of the World Series, scored 374.35 points for a comfortable win over compatriot Wang Han who took silver with 366.90 points. ‘I usually give my winnings to my Mum, ‘ Shi said afterwards. ‘She helps me save’. Bronze went to Canada’s Pamela Ware after a rarely seen dive off. After five rounds of diving Ware and Nadezhda Bazhina of Russia had identical scores of 330.65 points. Both then performed a single dive of their choice with Ware scoring 75 points and Bazhina 66 to secure bronze. The mixed 3m Synchro Springboard, a new event in the Diving World Series, was won by China’s Wang Han and Yang Hao. The pair, who scored 336.90 points, also won the event in Kazan. It was the second medal of the day for Wang adding gold to her silver in the individual event. Silver went to Jennifer Abel and Francois Imbeau-Dulac of Canada with 309.60 points and an unexpected bronze, to the delight of the home crowd, to the British pair of Grace Reid and James Heatly who finished with 299.76 points. Reid and Heatly are competing in their first World Diving Series. China has won six of the seven titles contested in the FINA/NVC Diving World Series after two days of competition. 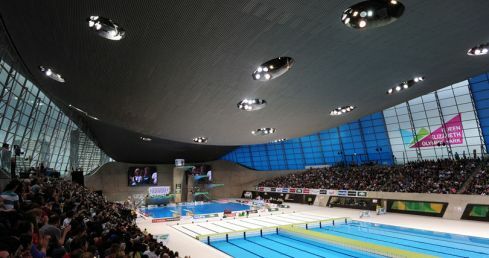 The event, which is taking place at the London Aquatics Centre in the Olympic Park, ends on May 3rd.